From the Hancock County Courthouse, take Hwy 22 southwest for 7.2 miles to Devereux. Turn right (at the backward fork) onto Main Street. Go 0.2 mile to the dead end and turn left onto Jones Chapel Rd. Go west on Jones Chapel Rd for 4.9 miles to Carr's Station Road. Turn right onto Carr's Station Rd and travel for approximately 2.5 miles to Island Creek Road. Turn right on Island Creek Road going northwest and go for 1.3 miles. 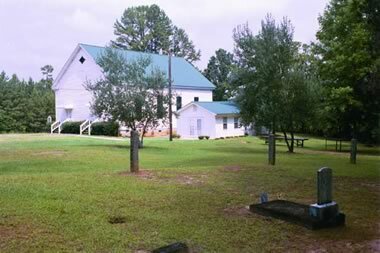 The cemetery is on the left side of the road and is next to the Island Creek Baptist Church. It is just before the intersection of Island Creek Church Rd (Pecan Way) and Island Creek Rd. Within an iron fence. 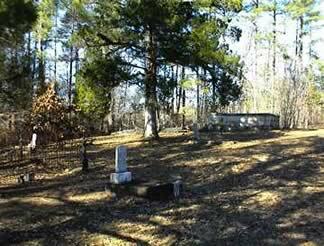 No other graves visible within the fence. A stone marks the grave. The grave is slightly sunken. The grave is marked by rocks. Within a fence with Lula Cherry. w/o George Cherry. Is within a fence with Gordon Grimes. s/o J. F. and M. L. Jackson. Part of a tombstone marks the grave. Co. F 9th Ga Regt. A large walled area with room for approx. 4 graves. There is some evidence of 2 graves. 5 unmarked graves in a row, each with a block indicating the presence of the grave. w/o John W. Moye. d/o Everett H. and Emily F. Pierce. s/o Jeff and Susan Eardley.